[Survey Results] 83% of IU Members Improved Their Trading! Investors Underground has come a long way since its inception in 2008. Over the years, we've continued to improve and expand our offerings to make sure all IU members get the most value from the service. In 2017, we've already launched a new chat room, released a free beginners trading course, and introduced a few new moderators to the community. We continue to look to our members for feedback on how we can improve the service. Our goal is to give everyone the tools they need to become well-educated, self-sufficient traders. We recently sent out a survey to our members to get feedback on the Investors Underground service. Here are the results. Investors Underground is home to a diverse group of traders with unique trading styles. 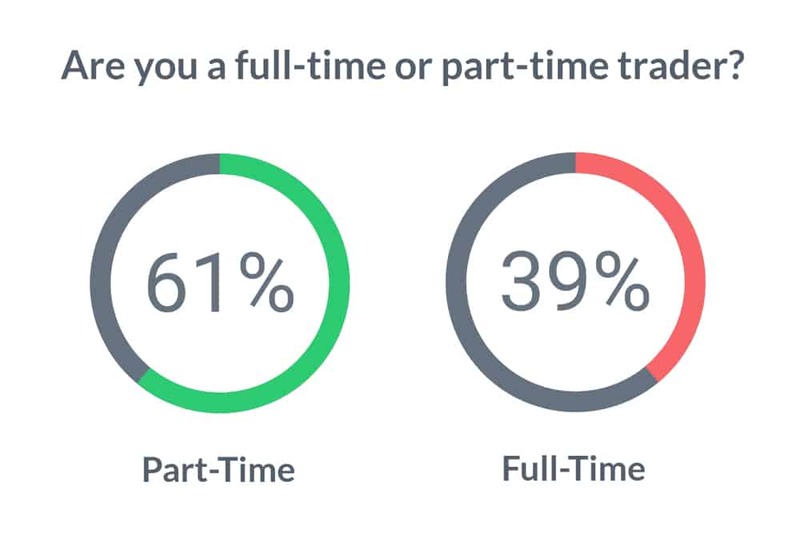 While a large percentage of our community consists of full-time traders, the majority are part-time. It's possible to work a job and enjoy day trading! Investors Underground offers a variety of resources for part-time traders, including our daily watch lists, swing trading chat room, and monthly webinars. This was arguably the most important question. We want to make sure that our community has access to all of the resources they need to become a better trader. 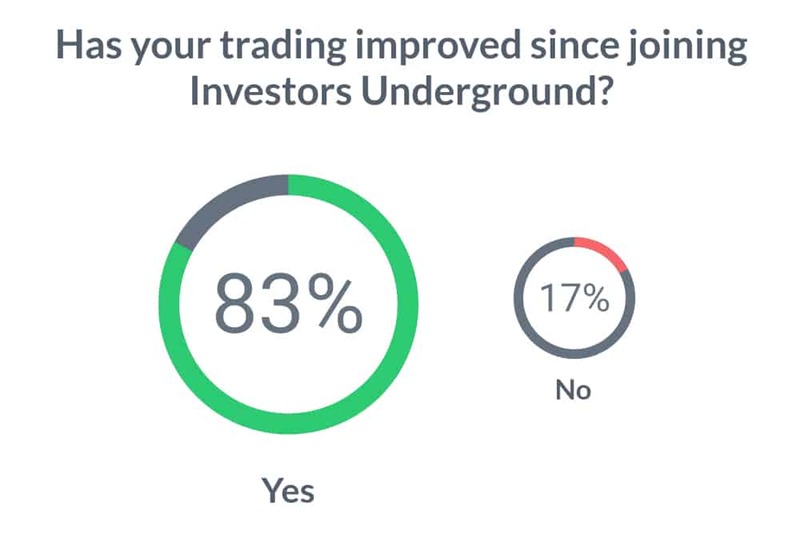 83% of our members improved their trading after joining Investors Underground. There's no doubt that trading can be tricky. You won't see us making any bold claims that you can become a millionaire overnight. That said, trading success is possible. We expect new traders to strive for consistency and continuous improvement and we're here to help you every step of the way. Learning day trading isn't cheap. At the very least, you'll have to pay your tuition to the market in the form of trading losses. Many new traders are hesitant to pay for a trading service when they are getting started and we're aware that the service can seem costly to some. While this hesitance is understandable, it's important to remember that cutting costs doesn't always save you money in the long run. For example, building a house out of cheap materials will likely cost you ten-fold in future repairs. A proper trading education and support system can save you money by avoiding potential losses and increasing your potential for profit. 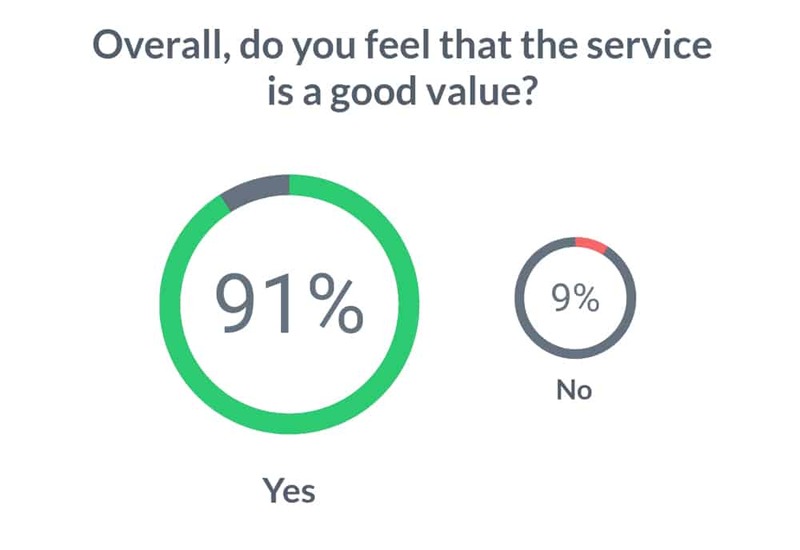 We were happy to discover that 91% of our members believe that Investors Underground is a good value. We continue to increase the value of the service by introducing new features and resources to our community. Our members ranked the Investors Underground scans as one of the most valuable features of our service (second to the chat room). Our scans are designed to help traders come to the market with a game plan. We want you to come to the market prepared for a profitable trading day. Of course, it's still up to individual traders to make sure they are doing their preparation, but we're here to provide the resources you need. We now offer a variety of watch lists from traders like Nate, Alex (AT09), Cody (@OddStockTrader), Emil, and Dante (@DGTrading101). We know you have a lot of choices when deciding which trading service you'd like to join and we appreciate everyone chooses Investors Underground. We strive to be the top trading community on the web and continuously work to accomplish this goal. 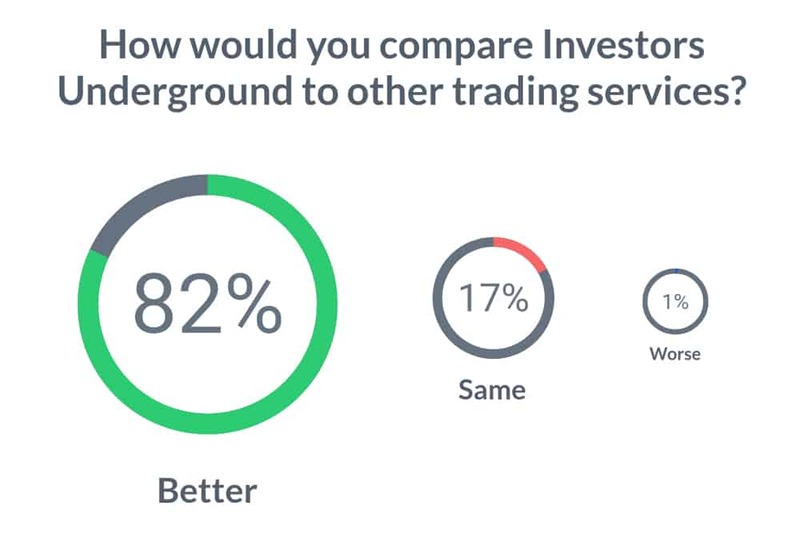 82% of traders believed that Investors Underground is better than the other trading services they've tried. No other trading site has as many experienced traders actively sharing ideas throughout the trading day. Furthermore, Investors Underground is a true community where experienced traders help propel beginner traders by sharing years of insight and guidance. Developing any skill set takes time and we want our members to be in it for the long haul. The trading issues you face one month may be different than the ones you face the next. We're here to give you the guidance you need to overcome the obstacles you face. Of course, in order to do this, we want our members to stick around! Mission accomplished. 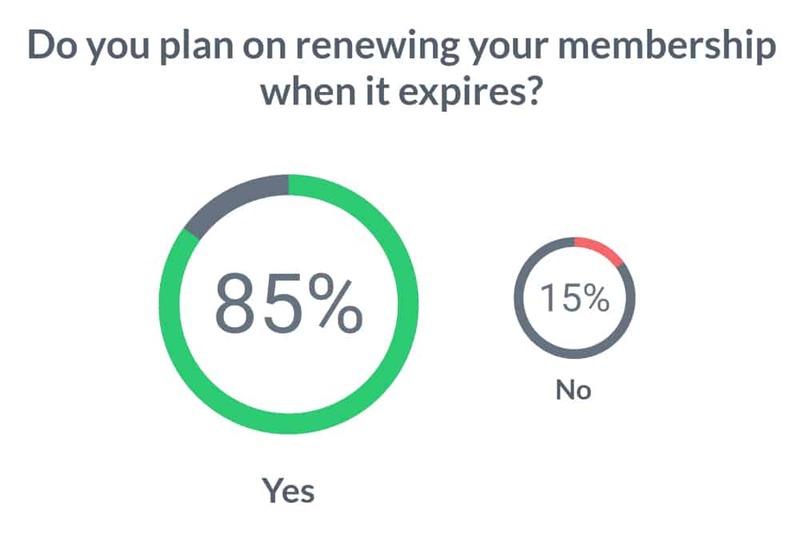 85% of our members plan on renewing their membership and continuing their trading journeys with Investors Underground. We appreciate all of our members and have plenty of exciting new things in store for 2017. If these results inspired you and you're ready to join the Investors Underground community, now is the time! You got good numbers (high percentages). There has never been any doubt IU is a wise choice. Keep up the good work. Congratulations.